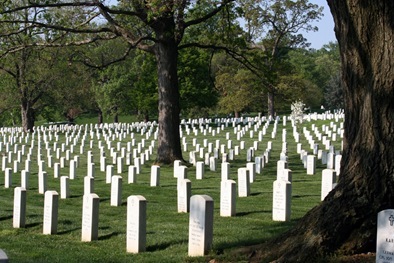 Memorial Day is a United States Federal holiday observed on the last Monday of May (in 2008 on May 26). Formerly known as Decoration Day, it commemorates U.S. men and women who perished while in military service to their country. First enacted to honor Union soldiers of the American Civil War, it was expanded after World War I to include casualties of any war or military action. As U.S. soldiers are fighting and dying daily, totaling much more than 4,000 to date, this opinion piece from today’s Washington Post is worth reflection. It’s author, William Troy, is a general. Throughout this war, the Army has maintained the practice of assigning a general officer to attend the funeral of every soldier who falls in service to our country. I’ve had this duty many times. The intensity of each funeral leaves me struggling to understand the enormousness of the sacrifice to which I have been a witness. mm369: Help! Rescue that droning man! Two of our most useful military news links in our blogroll are Danger Room and Early Warning. After all, we’re at war. Faithful reader of this nanocorner of the ‘Sphere© will recall that the subject of UAVs, Unmanned Air Vehicles or drones, is one of those topics that has consistently intrigued us. Look no further than the linklist above. Robot aircraft of all sizes and scales hit the military commentariat several times on April 30, and reminded us of a related story (see no. 1a below) we had been waiting for the right opportunity to surface. mm215: A Maginot Line for the 21st Century? The one where we get our boots muddy… but still can read about UAVs! As I begin to write, it is still December 7. Still lives in infamy, although those alive to hear President Franklin D. Roosevelt’s ringing phrases are leaving us every day. But an altogether fitting day to write about the military (okay, we’re at war. Every day we should be remembering and writing about the military, supporting and honoring our citizen soldiers stuck, truly stuck in the [quick]sand of Iraq). Guess the Washington Post thought so too. EL PASO — A $200 billion plan to remake the largest war machine in history unfolds in one small way on a quiet country road in the Chihuahuan Desert. Jack Hensley, one of a legion of contractors on the project, is hunkered in a slowly moving SUV, serving as target practice for a baby-faced soldier in a Humvee aiming a laser about 700 yards away. A moment later, another soldier in the Humvee punches commands into a computer transmitting data across an expanse of sand and mesquite to a site 2 1/2 miles away. On an actual battlefield, this is when a precision attack missile would be launched, killing Hensley almost instantly. In the Army’s vision, the war of the future is increasingly combat by mouse clicks. It’s as networked as the Internet, as mobile as a cellphone, as intuitive as a video game. The Army has a name for this vision: Future Combat Systems, or FCS. The project involves creating a family of 14 weapons, drones, robots, sensors and hybrid-electric combat vehicles connected by a wireless network. It has turned into the most ambitious modernization of the Army since World War II and the most expensive Army weapons program ever, military officials say. FCS was devised in the 90s in response to the Army’s recognition that its responsiveness to the new paradigm of asymmetric warfare was altogether too sluggish. Of course, the government, especially its military, cannot plan to spend $200billions without controversy. Hugely ambitious, those plans have consistently, like every government program, delivered less than promised, later than promised. It probably is no surprise that every time FCS hits the news, its quoted costs rise, from $92billion when launched in the 90s, to $117billion in this interesting overview from 2004, to today’s $200billion and counting. Danger Room, a member of L-HC‘s noted the Post’s story, and pointed to a most illuminating analysis published last May at a site, new to this writer, GovernmentExecutive.com. Four years into the program, the Army still has not fully defined what the program’s vehicles, drones, robots and computer networks are required to do, GAO’s Francis says. Software needed to control FCS has doubled from initial estimates to a staggering 63 million lines of code, three times the amount being written for the Joint Strike Fighter. Of FCS’ 49 critical technologies, only one is fully mature. GAO noted that immature technologies are “markers for future cost growth.” The Army says 75 percent of FCS critical technologies have reached prototype stage. GAO disputed those claims, backed by an independent review team’s assessment that less than half the critical technologies were close to the prototype stage. 63 million lines of software… breathtaking. And, sure to grow. And then there’s the issue of component weight. GAO pointed to the FCS vehicles’ burgeoning weight as signs of a program that remains poorly defined and predicated on technological breakthroughs that so far have failed to materialize. The Army originally wanted FCS vehicles to weigh less than 20 tons, and Boeing promised to meet that goal. But so far, engineers have failed to develop the high-tech, lightweight electromagnetic and composite armors required. Last year, Maj. Gen. Jeffrey Sorenson, the Army acquisition deputy, said vehicles would weigh 24 tons. Army budget documents released this year said FCS vehicles would tip the scales at 27 tons. Weight growth of a vehicle meant to be rapidly deployable by air is not an immaterial concern. The analysis does a most comprehensive job of illuminating the planning and design flaws of the system. The tilt-rotor heavy lifters, whoppingly expensive with insufficient cargo capacity, and fatal vulnerability to even today’s inexpensive ground and air defense systems. The remote sensor systems that even today are fragile and proving inadequate to the realities of Iraq and Afghanistan. Armored vehicles that, as designed, would be unable to prevent fatal damage from even today’s IEDs, improvised explosive devices, which have killed or maimed so many U.S. personnel and their transports, much less future weaponry an enemy would be expected to field such as automatic cannon. And always the issue: however brave the intention, FCS is a response to past conditions that most certainly will again endorse the adage that generals are doomed always to prepare to fight the last war. But this nanocorner of the ‘Sphere©‘s fascination with UAVs (Unmanned Aerial Vehicles) was ratified with this illustration, encountered at HowStuffWorks.com while researching FCS. So as some of us reflect on warfare, and our preparedness to fight the next one, on this weekend where we remember the “day that will live in infamy” that found this country only semi-prepared to fight a world war that had started nearly 10 years before, one can only sigh. FCS: A 21st century, mobile, high-tech version of the Maginot Line?